After severe (and not too much) critics to the format of the page, this economist (not taste at all) will do his best effort to improve it, hopefully the blue litany will belong to the past and the future new horizontal menu (which many friends told me "is the Fashion") will provide a more user-friendly navigation. Also, in consideration of many friends from the North, I make my bet... introducing an English version, of course, is a "very latino" English not intended to be stylish. Well, let's start with the topic that I want to share in this opportunity, the world famous "Nationalization of Hydrocarbons in Bolivia." Certainly the number of texts written on the subject is enormous, there are pros, cons, focused from the politically, technical, business, social, anthropological, sociological, historical, views. With no doubt, the "Diablo Etcheverry" in the past and now the nationalization of hydrocarbons, put Bolivia on the map. Interestingly what is not so well known is the true fiscal impact of the process, since the incomes received by the Bolivian government are usually handled on a global basis. This, of course, is not the result of neglect of a public official, in contrast, is a smart way to "see things". So far nothing new, however, lets look behind these figures. First, Figure 2 presents the international oil price and the Bolivian natural gas exports price behavior... the correlation is very high, but not surprises me. Why? 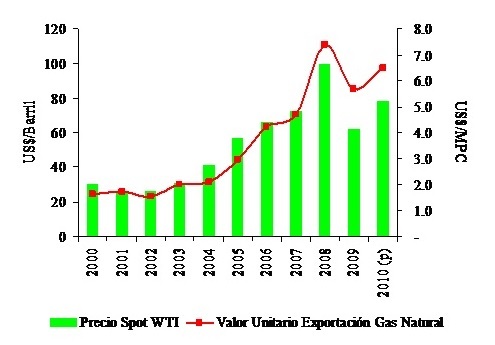 Because, when Bolivia's Government agree the natural gas sale prices with Brazil, during the nineties, "tied" this exports prices to the international oil prices. Therefore, if the WTI rises, so does the export price, of course, the opposite is true. Second, Figure presents the natural gas exports volumes to Brazil and Argentina. 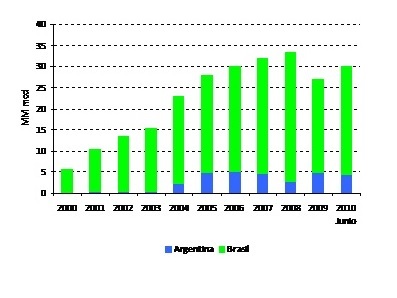 During the period in question, there is a remarkable growth in this variable, it's not redundant to say that the volumes of exports to Brazil (in green on the chart) were agreed in the nineties. What we have seen so far? 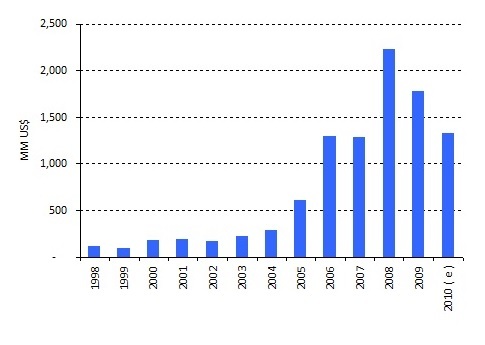 Thanks to the extremely favorable price situation and huge volumes of Bolivian natural gas exports, the "size of the cake" took dimensions that even the most greedy of Bolivian technicians in the nineties couldn't anticipate, all the Project Export Finance was constructed for a US$/Barrel 20,... in the end, there were the nineties! With all the suspects in the room, we can now reveal the secret. Figure 4 shows how the Bolivian government participates in the great cake that I referred in the preceding paragraph. 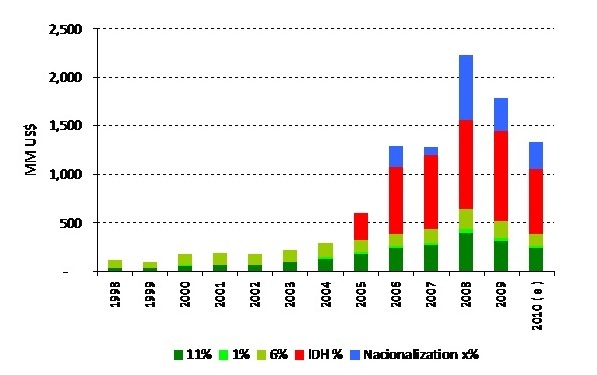 See, dear lector, that the main source of fiscal resources came from the Direct Tax on Hydrocarbons (IDH) highlighted in red in the graph, this is a production tax created in 2005 ... yes 2005, a year before the nationalization by the president of the Old Republic, Hormando Vaca Diez, this tax now is been coparticipated to the regions, indigenous people, police, etc. Finally, the nationalization created additional resources (in blue) for Bolivian state oil company, YPFB. Were our star players in this game against historical evil fiscal deficits, however, as many good Mexicans friends will say:, "no se vale (it's not fair) that only one of them take all the glory "... even with the hand of God.